President, Directors, and tutors must be known to the value of a website that how it can increase the value and strength of their educational institutes. In today’s modern era when it comes to education, student search on the internet to find out the best school, college or university they want to go for their education and here website plays a vital role to impress the student for your educational institute. 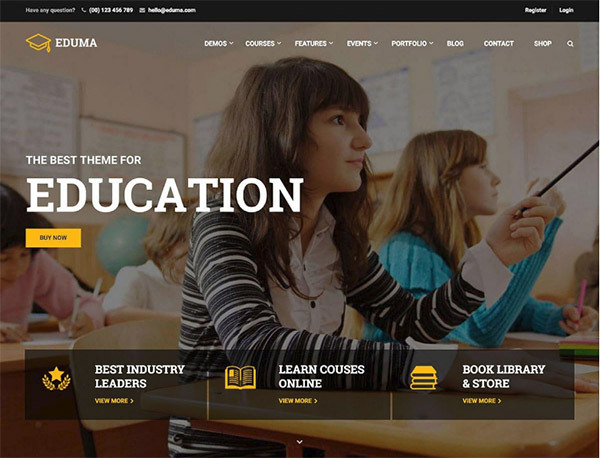 Below given 6 themes are best suitable for your college, school or university website as they are focused on UI and functionality. WPLMS is purposely intended as an education management system that features management for courses, teachers, and students. It enables the tutors to create and sell their courses online through their website. WPLMS is #1 selling WordPress theme under education category. It is fully responsive to all kind of devices and has a spontaneous interface. It is user-friendly and makes easy to find the users what they are looking for. Updates and support of WPLMS are free and have compatibility with various popular plugins such as BuddyPress, Visual Composer, WooCommerce and Layer Slider. WPLMS stands out of all themes because of its learning management plugin that covers everything from student and tutor dashboard to course creation. It is hard to beat WPLMS due to its learning management plugin in education themes of WordPress. Learning can’t be joyous within books, therefore, its, vital to choose a theme for your website that is inviting, engaging and offers good functionality with perfect UI and UX. When we talk about functionality that means it should have necessary functionality that is required for making learning effortless and comfy. And Engine WP has all these qualities in plenty. On the whole, Engine WP is comprehensible and friendly for the users. 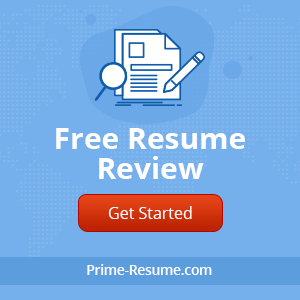 It goes ideal with Learnpress plugin and this plugin is absolutely free in wordpress.org directory but if you go for premium add-ons then it can definitely give your competitors a strong competition. If you go for add-ons then it will enable you to assign courses to co-instructors, issue certificate feature, etc which will help you to make an extremely influential theme. The theme is in default yellow color helps in stimulating a sense of warmth. Engine WP provides you with nine diverse demo layouts to decide from and all these layouts are imported with one click. Moreover, by using the SiteOrigin Page builder plug-in any kind of layout can be created in Engine WP. 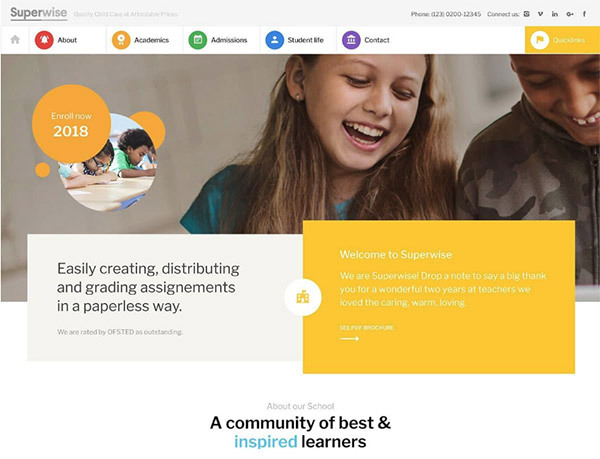 SO in the whole Engine, WP is obviously in the top of the class in education WordPress them and best suitable for your thought to create eLearning website. Lincoln is beautifully designed theme as per up to date principles while keeping particularly education institutes in mind. If you looking for something that needs to be dynamic and perform multifunction feature then this theme is best suitable for you. It has amazing and unique features such as four layouts for the home page, parallax scrolling and already integrated premium plugins such as Slider Revolution and Visual Composer. Lincoln includes an abundance of custom-designed content that will be quite useful for your institute’s website. Licoln enables you to inform everyone about events in your institute with its inbuilt splendidly comprehensive event calendar such as games, theaters, etc. This theme has a page where parents of each and every student can check the bio of tutors that help parents and student to let know in depth about the tutor. Learndash plug-in is most exceptional and ground-breaking feature of Lincoln. It is a robust online course app that allows the tutor to upload reading material, grades, syllabus, etc in an online portal. You can be confident about Lincoln that it will be definitely going to be an excellent theme for your institute. A good quality education theme should make the procedure of class management and assignment while stressing on the winnings of your educational institute. And Superwise is something that is proficient in these both areas. Superwise is bundled with the Visual Composer that is currently known as WPBakery Page Builder. This feature makes the process of creating layout simple and creative enough. Moreover, the most popular Contact Form 7 form is also there to simplify the process of creating enrollment inquiry by users. It is smoothly integrated with Google Classroom that enables tutor to schedule video or voice conference, schedule assignments, and many more other things. Superwise is easy to use and includes premium plugins in it. It will give you a website that runs robustly and certainly. Masterstudy is a money saving and very well integrated theme with rich premium plugins in it and creates a valuable experience for both tutors and students. The main focus of theme is online courses, whether it is for an individual, business or tutors. It can be used by all kind of education institutes such as small, medium and large school, college or university. It is integrated with premium WooCommerce plugin that makes course listing easy and classes are manageable on the basis of different categories. Masterstudy offers three layouts for listing your courses that are listing, single and grid course and it enables you to make your offerings as you see fit for your institute website. Moreover, it has countdown event style calendar that adds a sense of importance to perceptive courses and seminars. Three different type of video and photo galleries, four different blog post layouts, and three alternatives for event templates helps in making your website’s customization most appealing feature straightforward. Premium MailChimp subscription manager gives you the authority to send emails to users for upcoming updates related to price, courses, bloggers etc. Whether you are the individual tutor or running you large educational institute, Masterstudy is the best combination of excellent UI/UX and functionality. If you are looking for a website that must have the power to convince people to invest in your courses then it is important to have an appealing and user-friendly website. For this, you can have a look at “Skilled”. The best part of this theme is its forefront. You have a section of Google Fonts, six color schemes to chose from and all in bright shade to make your website alluring. The LayerSlider plugin in Skilled allows you to display imperative courses or information significantly. And there are four layouts for the demo to choose from. Any other customization can be done through Ultimate Addons and Visual Composer. Sensei plugin is supported by Skilled and for this a further purchase is essential. 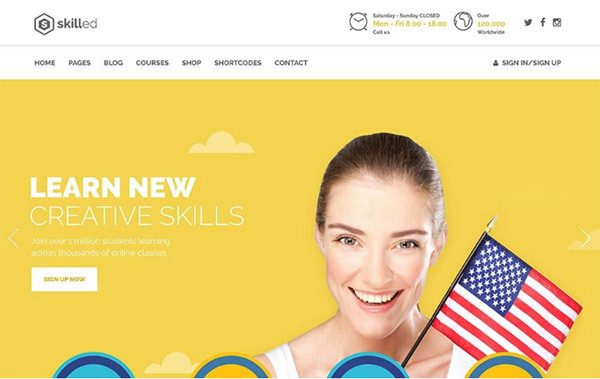 Skilled is a package of knowledge to guide you and proficient developers have built a praiseworthy theme with almost everything that is required to sell your courses online through your website. To sum up, the above described themes are best for all kind of educational institutions. And if you are looking forward to building an impressive, creative and user-friendly WordPress website for your institute then you can trust on these themes as they have good UI/UX and functionality in abundance. 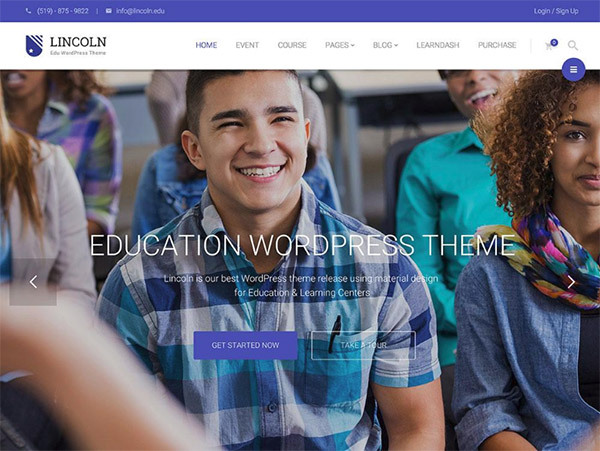 Hopefully, these elegant and full of good features WordPress education theme will help you to make your website look professional and appealing. April Burns is a Blogger and WordPress developer who have 4+ year of experience in developing website for various industry segment. he is working with Rejoin Web Solution- A WordPress website development company in India. He loves to share his knowledgeable content with the people.